You'll find plenty of places to visit near Tuovilanlahti: Jyrkkakosken Ruukki (in Sonkajarvi), Riuttala Farmhouse Museum (in Karttula) and Southern Konnevesi National park (in Rautalampi). Spend the 18th (Thu) exploring nature at Tiilikkajarven Kansallispuisto. For photos, traveler tips, other places to visit, and tourist information, go to the Tuovilanlahti trip itinerary planning app . Madrid, Spain to Tuovilanlahti is an approximately 18-hour flight. You can also drive. Due to the time zone difference, you'll lose 1 hour traveling from Madrid to Tuovilanlahti. Traveling from Madrid in July, expect nights in Tuovilanlahti to be a bit cooler, around 15°C, while days are cooler, around 24°C. Finish your sightseeing early on the 18th (Thu) so you can travel to Kuopio. 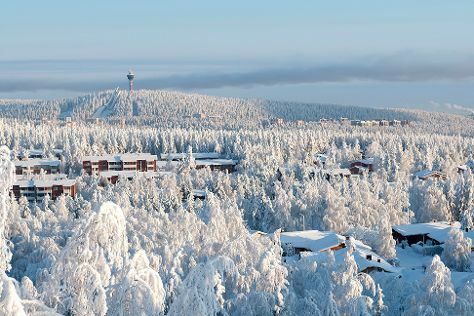 Kuopio is a city and a municipality located in the region of Northern Savonia, Finland. On the 19th (Fri), enjoy breathtaking views from Puijo Tower, see the interesting displays at RIISA - Orthodox Church Museum of Finland, explore the activities along Valkeisenlampi, then ponder the world of politics at Kuopio Market City Hall, and finally test your team's savvy at popular escape rooms. Get ready for a full day of sightseeing on the next day: see the interesting displays at Kulttuurihistoriallinen Museo, enjoy some diversion at Vainolanniemi, pause for some serene contemplation at St. Nikolaos Cathedral, examine the collection at Kuopion Korttelimuseo, then immerse yourself in nature at Snellman Park, and finally pause for some serene contemplation at Lutheran Cathedral. Traveling by car from Tuovilanlahti to Kuopio takes an hour. In July in Kuopio, expect temperatures between 24°C during the day and 15°C at night. Finish your sightseeing early on the 20th (Sat) so you can travel back home.